By the 1920s, psychoanalysis was a technology of both the late-colonial state and anti-imperialism. Insights from psychoanalysis shaped European and North American ideas about the colonial world and the character and potential of native cultures. Psychoanalytic discourse, from Freud’s description of female sexuality as a “dark continent” to his conceptualization of primitive societies and the origins of civilization, became inextricable from the ideologies underlying European expansionism. But as it was adapted in the colonies and then the postcolonies, psychoanalysis proved surprisingly useful for theorizing anticolonialism and postcolonial trauma. Our understandings of culture, citizenship, and self have a history that is colonial and psychoanalytic, but, until now, this intersection has scarcely been explored, much less examined in comparative perspective. 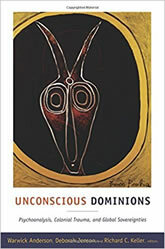 Taking on that project, Unconscious Dominions assembles essays based on research in Australia, Brazil, France, Haiti, and Indonesia, as well as India, North Africa, and West Africa. Even as they reveal the modern psychoanalytic subject as constitutively colonial, they shed new light on how that subject went global: how people around the world came to recognize the hybrid configuration of unconscious, ego, and superego in themselves and others.